Online automated quality assessment is critical to determine a sensor抯 fitness for purpose in real-time applications. 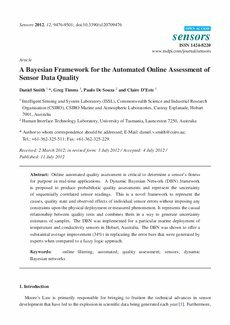 A Dynamic Bayesian Network (DBN) framework is proposed to produce probabilistic quality assessments and represent the uncertainty of sequentially correlated sensor readings. This is a novel framework to represent the causes, quality state and observed effects of individual sensor errors without imposing any constraints upon the physical deployment or measured phenomenon. It represents the casual relationship between quality tests and combines them in a way to generate uncertainty estimates of samples. The DBN was implemented for a particular marine deployment of temperature and conductivity sensors in Hobart, Australia. The DBN was shown to offer a substantial average improvement (34%) in replicating the error bars that were generated by experts when compared to a fuzzy logic approach.